When we arrived in Romania much of what we knew about the country was its role as an elusive nation behind the Iron Curtain during our childhood. What we found surprised us. A vibrant nation with a beautiful countryside that is rapidly putting the past behind it. Another surprise, the 3rd fastest Internet in the world and by far the fastest we have seen in our travels to over 70 countries. 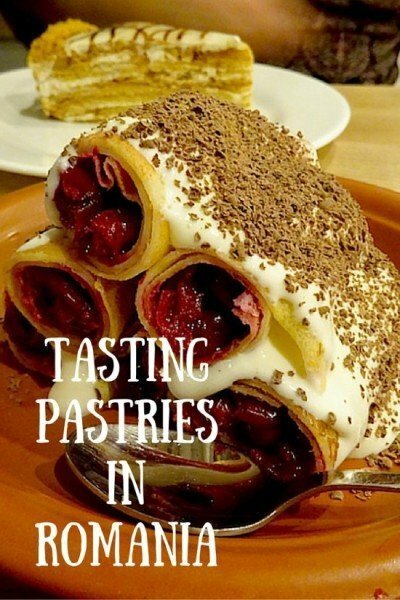 But as usual we start with food and having a sweet tooth, we soon found ourselves tasting Romanian pastries on a daily basis. Papanași (papanosh) are little tater tot sized donuts (or bigger at some places) topped with sour cream and cherry jam. It’s the first donut treat I’ve met (and I’ve met many) that you eat with a spoon. 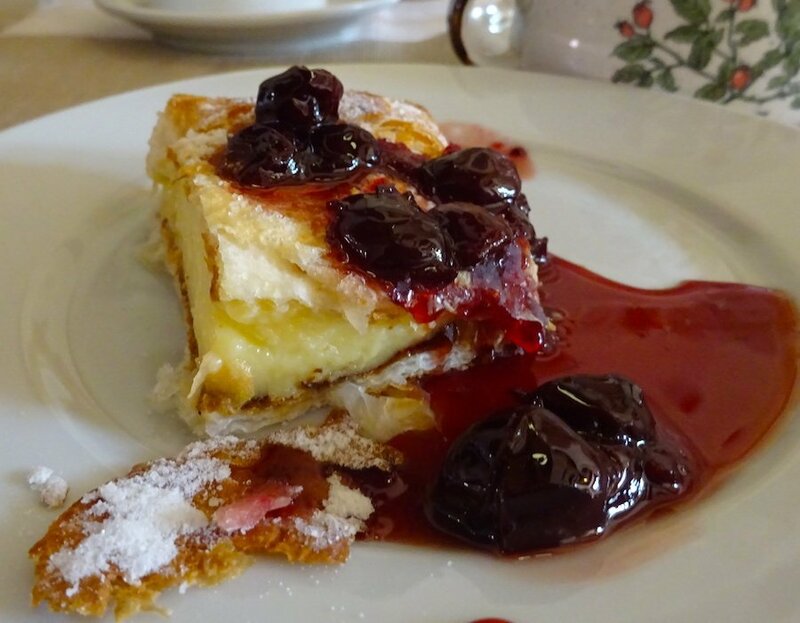 Carpathian Mountain Cream Cake with sour cherry jam at the Fronius Residence, a 16th-century inn located in the walled medieval village of Sighisoara. 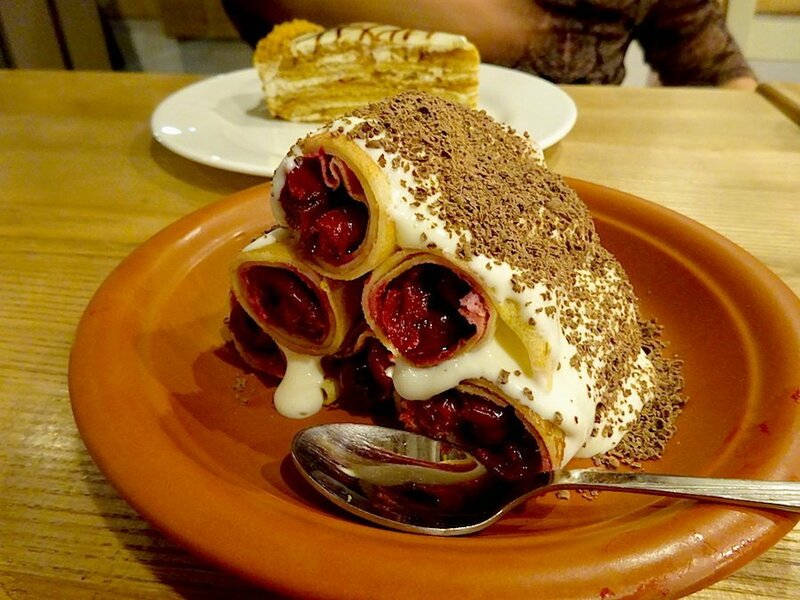 Caciula lui Guguta is a pile of rolled up pancakes stuffed with wild cherries and topped with vanilla whipped cream and grated chocolate. Despite the fact that Larissa ordered something else she ended up eating half of my dessert. We found this version at La Placinte, a mini-chain of restaurants with several locations in Bucharest and a few other Romanian towns. 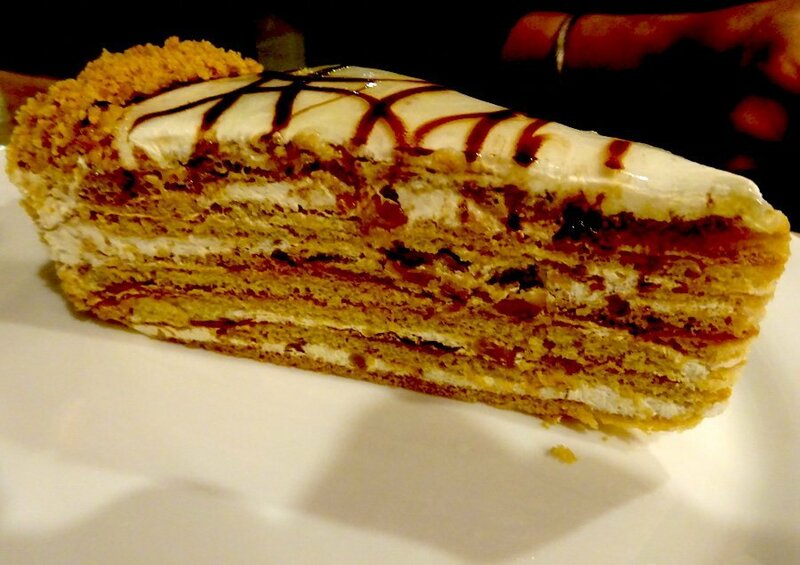 According to the menu this is “Honey sponge cake impregnated with creamy nuts and sour cream.” Something may have been lost in translation but I did feel stuffed and like I had eaten for two afterwards. 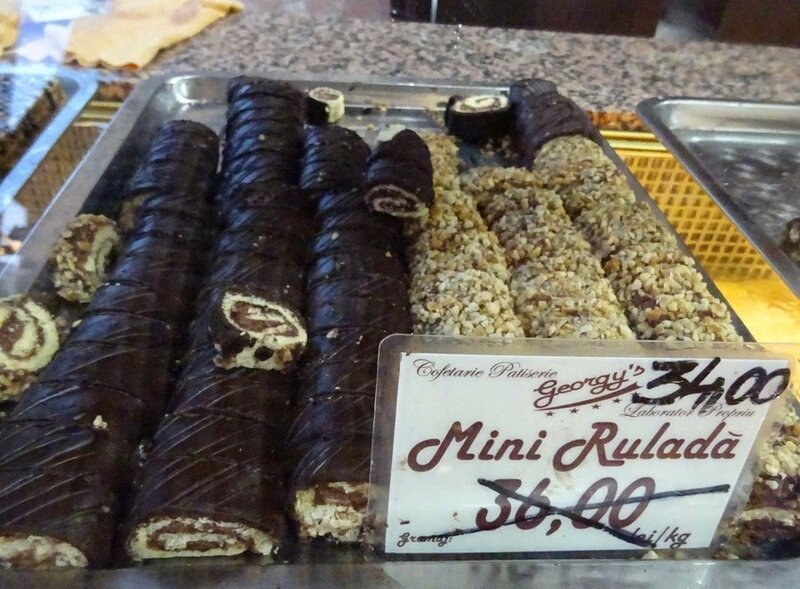 I think these are actually Swiss Rolls (the Yodels of my youth) but they sound more exotic as “rulada.” How can vanilla cake twirled around chocolate icing then rolled in nuts be bad? I haven’t yet mentioned what an incredible travel value Romania is. Here’s an example. 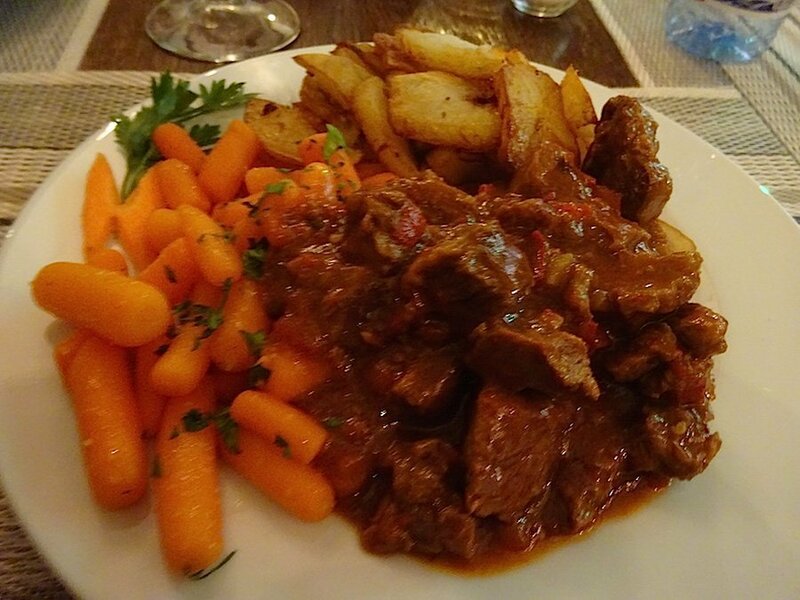 The delicious meal below of spicy goulash, Romanian potatoes and sauteed carrots in the posh Restaurant Transilvania in Brasov was $4.50. Most of the pastries above were about $3. 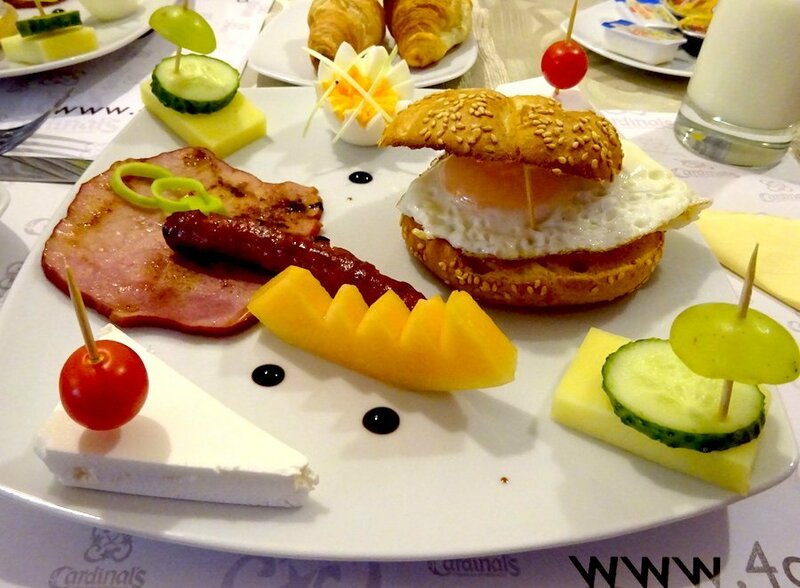 The breakfast above was included with our $58 per night room (including tax) at the high-end 4 Cardinal’s Hotel in Brasov. 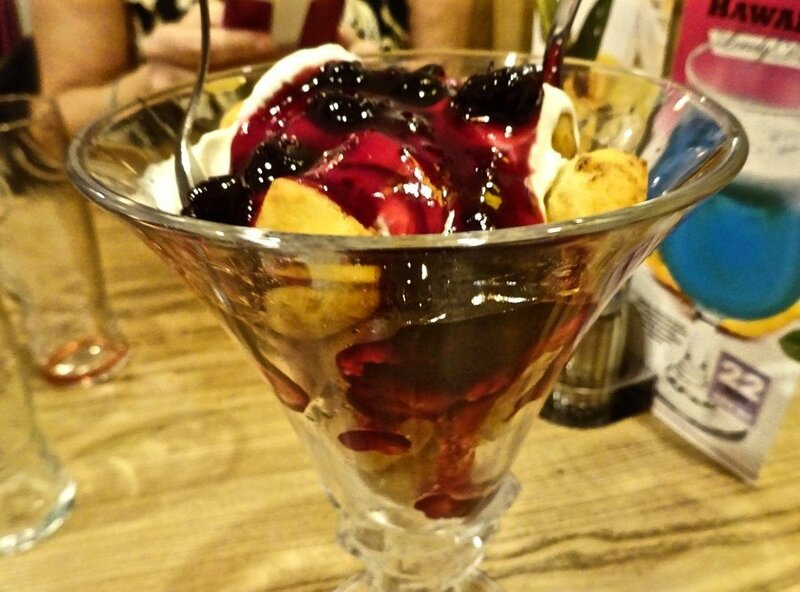 We found Romania to be a great place for food and to stretch a European travel budget. In future posts we’ll talk about surprising Bucharest and the medieval villages we visited on our road trip through the Transylvania section of Romania. 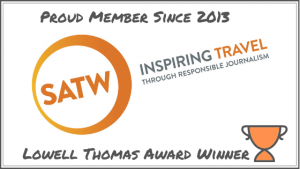 Please let us know if you have any questions about travel to Romania. 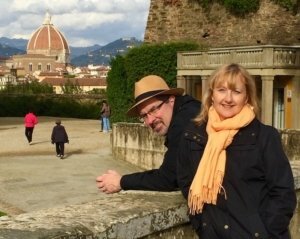 We’re global nomads who have been traveling the world since 2011 seeking off-beat, historic and tasty sights. 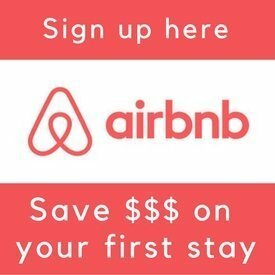 To receive monthly updates and valuable travel tips subscribe here. 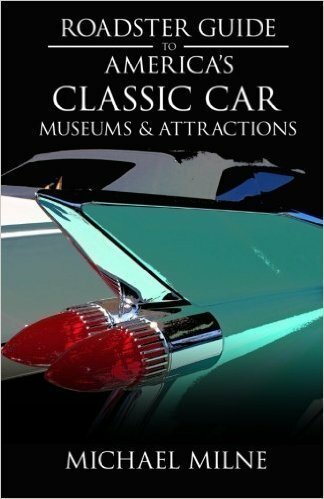 Previous post: WWEE: What would Elvis eat?